"The latest PowerBooks feature higher-resolution displays, longer battery life, and dual-layer SuperDrives - but not much in the way of substantial jumps in performance over their predecessor in Macworld Lab testing. "The subtle effects on performance weren't surprising, given the nature of the changes introduced by Apple earlier this month. After all, the update to the 15-inch and 17-inch laptops didn't include any increase in speed from the 1.67 GHz PowerPC G4 chip featured in previous models. Meanwhile, two of the most prominent additions - increased battery life and the ability to burn dual-layer (DL+R) DVDs - are not measured by Macworld's Speedmark performance testing tool. Other improvements, like increased drive capacity, higher screen resolution, and faster DDR2 memory contributed to only minor differences from the results posted by the previous generation of 1.67 GHz G4 PowerBooks." "Apple's PowerBooks and iBooks are generally well-made, value-for-money machines, but they suffer from a critical design flaw - the tip of the AC power adapter is prone to breaking off inside the power port. "It's a costly and time-consuming repair, and it's almost impossible for owners to fix themselves. I know, because it's happened to me three times in the last three years. "The last time was just last week, and the story of how I fixed it is a saga you can read after the jump. Long story short: I finally dug it out in a frenzy of rage and frustration that almost ruined a $2,500 computer." PR: SimpleTech, Inc., a designer, manufacturer and marketer of custom and open-standard memory and storage solutions, today announced the addition of the SimpleDrive Mini 1-inch External USB Hard Drive to its line of storage products. With this addition, SimpleTech continues to provide cutting-edge, affordable storage solutions to meet the needs of its customers. The demand for computer storage is greater than ever. A rise in storage requirements for digital files and consumer demand for mobility has focused the spotlight on high-capacity portable storage devices. "We are proud of our expanding storage line that extends from portable USB Flash Drives and SD Cards to the stationary mass storage solutions for the desktop and home," said Patrick Wilkison, vice president of marketing and business development at SimpleTech. "The release of the SimpleDrive Mini brings multiple storage technologies together to create a storage solution with ultimate flexibility. We can now say with confidence that we have a storage solution for every consumer storage need." Initially available as a 4 GB model, the new SimpleDrive Mini is a hard drive with the coveted compactness and portability of flash technology. With business card-like dimensions, and no thicker than a pack of gum (2.05". x 2.56". x 0.55".) the SimpleDrive Mini tips the scales at a featherweight 45g, and easily fits into a shirt pocket or briefcase. Important files and digital keepsakes can be safely stowed on one's person as a mere afterthought. 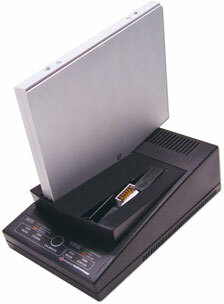 As an important feature, the SimpleDrive Mini is powered by, and communicates with the host computer via a built-in retractable USB cord, eliminating the need to carry additional cables. Designed to meet the needs of mobile users, the SimpleDrive Mini is a durable, shock-resistant external USB hard drive that works seamlessly between both Windows and Mac platforms. 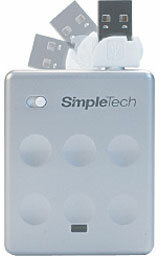 The SimpleDrive Mini is a plug-and-play device that doesn't require additional drivers, providing quick and easy transfer between multiple computers. As a result, mobile users can have the confidence of knowing that no matter where they are or what computer is available their files are both safe and easily accessible. Staying in step with the latest in file transfer technology, hours of digital music and thousands of photos can be backed-up in a matter of minutes, in credit to the speed and convenience of USB 2.0. To mobile users, USB 2.0 represents on-the-fly peace of mind by allowing files to be transferred at speeds up to 480 MBps. PR: RadTech, makers of iPod and mobile computing accessories and more, have announced immediate availability of Omni work-in armored sleeves, and I-Sight Personal Illuminator. Omni is a lightweight, poly-reinforced work-in armored notebook sleeve - a follow-on to the successful tekmod work-in messenger brief. With Omni, RadTech offers a whole new level of freedom and functionality for mobile computing. Omni's unique design features work-in functionality with unrestricted access to all ports and drives, while in the case! The integrated flip-out riser stand provides an ergonomic typing angle for comfortable and efficient keyboarding. The Sleeve incorporates two surface-mounted handles, and an adjustable and detachable, minimalist shoulder strap. Omni's are available now in two sizes and six colors, and will fit most sub-17" notebooks. Pricing starts at $42 . 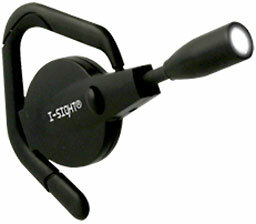 I-Sight is an ear-worn personal illuminator, which replaces RadTech's popular eyelighter product and provides numerous enhancements. The overdriven, super-bright Nichea LED module features a parabolic reflector and precision focusing lens to provide a phenomenally bright and uniform beam pattern, with no hotspots - just pure and even lighting. I-Sight's reversible and adjustable ear loop allows use with or without glasses on left or right ears. Weighing a scant 18 grams, and featuring a useable, continuous runtime of over 36 hours, I-Sight illuminates the wearer's field of vision, with no distracting side flare - while keeping both hands free. An easy to use push-button power switch, fully aimable lamp module and tool-less battery replacement round out the feature enhancements. RadTech's former eyelighter product has been used extensively by astronomers, photographers, mechanics, engineers, electricians, plumbers, backpackers, campers, law enforcement and others. I-Sight is available in two illumination colors: bright white for general tasks, and green for situations when dark vision needs to be maintained. Affixes to right or left ear; compatible with eyeglasses and most Bluetooth headsets. PR: Adding to the firm's successful line of innovative performance accessories for Apple Macintosh laptops, Newer Technology, Inc. (NewerTech) has released a line of Intelligent Battery Charger/Conditioners for select iBook G3/G4 and all PowerBook G4 models. "We already make industry-leading batteries for these laptops," said Larry O'Connor, president of NewerTech. "Now we give our customers the means to best maintain and even restore both stock and after-market batteries - and at an affordable price." The NewerTech Intelligent Battery Charger/Conditioners are available immediately for $149.95 for all Apple PowerBook G4 and select Apple iBook G3/G4 models. The Intelligent Battery Charger/Conditioners have been designed with a dual purpose in mind: to charge and condition. Both bays charge the batteries, allowing two batteries to be fully charged at all times. The second bay also conditions new or 'abused' batteries - those that may have incomplete charging cycles that prevent full cell use - providing for full utilization of available run-time capacity. "NewerTech NuPower™ batteries offer the highest capacities and longest run-times available for Apple laptop models," O'Connor added. "And now NewerTech's intelligent battery charging stations allow users to maximize their use of stock or NewerTech high-capacity batteries." PR: Python XL is not for everyone. If you want large capacity and lots of pockets, a rugged design and solid laptop protection, Python may just be the backpack for you. In terms of utility, Python is one of finest laptop backpacks available: Waterproof zippers, weather-resistant ballistic nylon exterior and tough, seatbelt nylon straps, a rigid-frame laptop compartment designed to protect the world's largest laptops, lots of padded pockets and compartments for items large and small, a dedicated iPod pocket with non-scratch lining, a stand-alone removable accessory bag, removable waist strap, sternum strap, and much more. In terms of capacity, Python is hard to beat: You'll have room for a stack of books 6" high, a complete set of clothes with shoes, large document folders and shipping envelopes, water bottles, (SLR) camera with lens, plus your complete set of typical laptop accessories like cables, mouse, power adapter and more. Python even has a secure iPod pocket completely lined with non-scratch fabrics, protected by two layers of zippers. Python comes with a small clip-on accessory bag called Ecto, convenient for those times when you want to keep your valuables close to you. Featuring a variety of pockets and compartments for your iPod, wallet or checkbook, a small digital camera, cell phone and a few other small items, Ecto ships with a 1" wide, removable nylon shoulder strap. Clip Ecto to your Python backpack for additional storage or leave it at home. 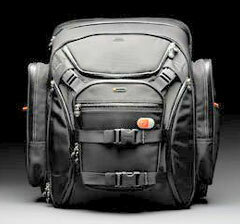 Or, take your valuables with you inside the Ecto bag and leave your backpack behind - whatever suits your needs. Like all BOOQ bags, Python has been designed by BOOQ in California with the professional user in mind, and every bag is covered by BOOQ's Lifetime Repair Warranty, which shows our commitment to creating products with the most refined design and highest quality. Again, Python XL is not for everyone, but if you are looking for the most rugged, most versatile backpack that can hold your laptop and everything you need, this backpack's for you. 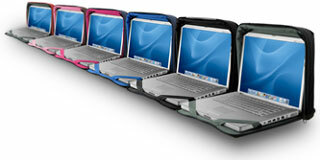 The complete large-capacity laptop backpack solution for 17-inch laptops. Rugged, large-scale performance and virtually unlimited storage options come standard. Includes a sleeve of choice and two accessory cases. Room for a stack of books 6" high, shoes, water bottles, SLR camera etc. Exterior Dimensions: 20.0" x 17.0" x 8"